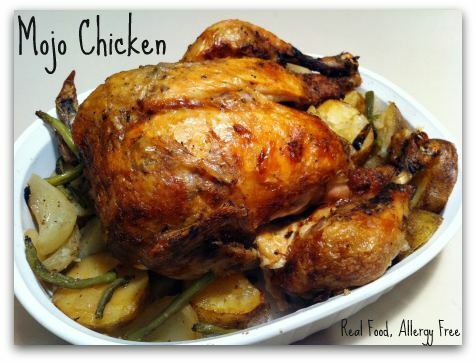 I shared before that I am trying to cook one locally pastured chicken per week. 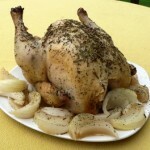 This week I tried a new recipe from the New York Times: Roast Chicken with Cumin, Honey and Orange. This marinade is gooood! The orange and honey work perfectly together to make my sweet tooth happy, while the cumin gives a subtle savory taste. This marinade is incredibley quick to throw together. I measured and mixed the three ingredients into a one cup liquid measuring cup so as not to dirty any more dishes than necessary. My only complaint about this recipe is that the meat was not as flavorful and moist as I would have liked. Even though I separated the skin from the breast and poured the marinade underneath the skin, most of the flavor remained in the skin. Dipping the meat in the drippings cured that problem. Seriously, I could eat the meat with the drippings on it everyday. I really like this marinade! I carmelized some vidalia onions (saute them until they become brown and soft) in the chicken drippings and whipped up some smashed potatoes. 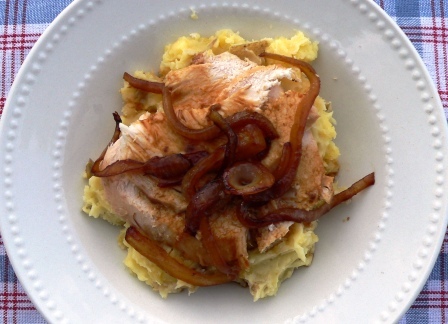 I scooped some potatoes in a dish, topped with chicken and onions and covered with more drippings. Mmmm, good! Update: I highly recommend making chicken stock with the leftover bones. You can read how here. I think the stock and leftover meat would be divine in this Bourbon Chicken Recipe. Combine orange juice, honey and cumin. Whisk until well blended. 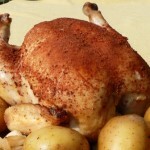 Place chicken (with giblets removed!) in a roasting pan. Pour marinade all over the chicken. Pour inside the bird. Loosen the skin around the breast by sliding your hand between the skin and breast. Pour some marinade in there. 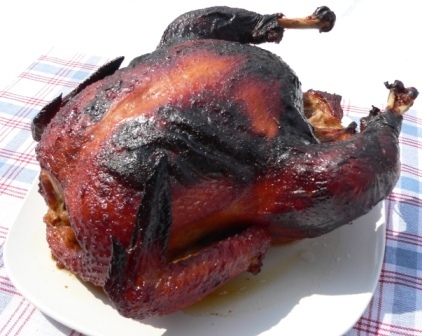 Bake for 20 minutes per pound, basting every 10-20 minutes. Let rest 15-20 minutes before carving. You may also enjoy Rotisserie Chicken in the CrockPot, Lemon Herb Roasted Chicken in the CrockPot and Mojo Chicken in the CrockPot. Who can resist the sound of sizzling fajitas being carried to your table at your favorite Mexican restaurant? 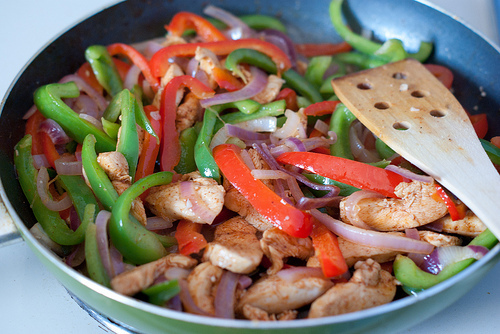 Fixing fajitas at home may not be as much fun but they are easy and just as tasty! 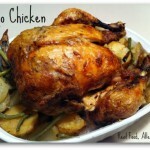 I usually use leftover chicken (Ginger-Lime Chicken is my favorite!) but it doesn’t take much more time to cook some chopped chicken in a hot, oiled skillet before you add the veggies. Serve with rice and beans. You can buy rice or corn tortillas but Bella likes to eat her fajita on a plate with a fork. Heat oil in skillet over medium high heat. Add onions. Cook until soft, stirring often. Add red and green peppers, taco seasoning, lime juice and salt and pepper to skillet. Cook just until peppers are soft, stirring often. Transfer peppers and onions to plate. Add remaining ingredients to the skillet. Cook until liquid is almost gone. Serve immediately. You may also enjoy Taco Potato. Did I mention we eat a lot of squash in the summer? Squash cooks so fast that it makes a wonderful, healthy lunch. While squash alone can be pretty bland, this recipe is full of flavor. Here’s how I fix my my favorite squash skillet. Heat oil in skillet. Cook onion and sausage until onion is clear and sausage is brown. Add squash and season liberally with Italian seasoning, salt and pepper. Cook until squash is tender. 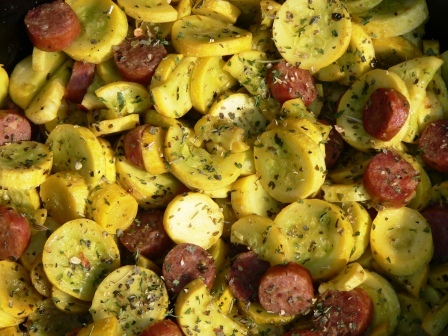 You may also enjoy Summer Squash and Chicken Skillet and Nancy’s Green Beans and Sausage.